It would not be wrong to say that every illegal or in other word, pirated software We use, may bring numerous security threats with it. Aside from Security threats, a pirated software also creates problems for overall PC speed and performance. It really sounds odd that most of the people, who don’t want to shell out quite a bit of money from their bank or cannot afford to buy a paid antivirus software, download security programs from pirating file sharing websites where hackers are sitting to hack your PC and cause you discomfort both mentally and financially. it is same as you ask a lion to protect a goat. You might ask me, How is it possible? Actually Instead of protecting you from security threats, Hackers may get into your PC and web browser to steal your privacy, username, passwords, credit card and other bank details using a pirated antivirus software downloaded from such a notorious pirating website after installing. This is why, It is strongly advised by security experts not to use illegal and pirated software especially antivirus programs. Security experts urge to use original antivirus programs and If you don’t want or cannot afford to buy a paid antivirus software then you can go for a freeware antivirus software. There are tons of free to use security programs available out there through which you can protect your PC from hackers and their deadly hacking weapons. 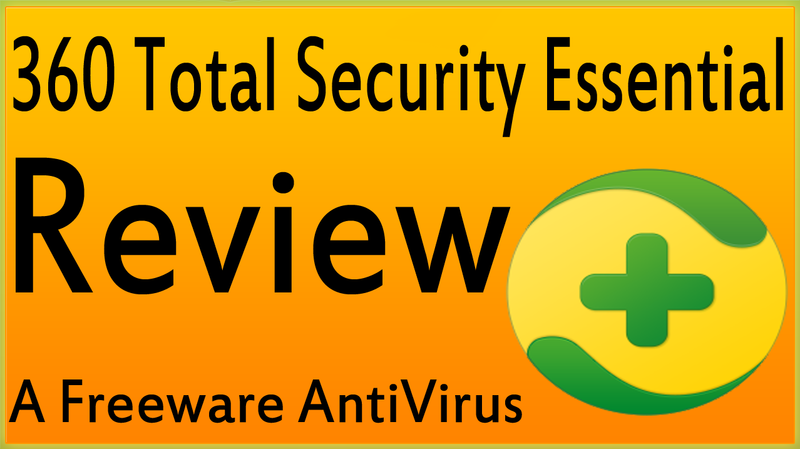 In today’s video, I’ll introduce 360 Total Security Essential to you and share what I found good and bad while testing this freeware antivirus in this 360 Total Security Essential video review. It would not be wrong to say that 360 Total Security Essential is one of the best and highly reputable yet free to use security suites. While testing this freeware piece of software, I’ve found 360 Total Security Essential a truly all-around security program for Microsoft Windows. 360 Total Security Essential has the ability to protect its users from all kinds of security threats, such as viruses, Trojans, worms, adware, spyware and phishing etc. The power of four top award antivirus engines is what that makes it differ than other freeware antivirus programs. 360 Total Security Essential is integrated 360 Cloud Engine / QVMII / Avira and Bitdefender to offer you complete protection and best detection rate. 360 total security.com offers two installers, one with having turned on 360 Cloud Engine and QVMII and You can turn on Bitdefender and Avira engines by installing other installer to triple the antivirus protection. This feature-rich yet free to use antivirus program comes packed with 6 very useful security features respectively a real-time guard, multiple scan modes, a quarantine, reports, a self-protection module to stop hackers from disabling the antivirus, and my favorite one is a sandbox through which you can safely run or test unknown programs in an isolated environment without harming your PC. As well as You can go for a Chrome extension and Firefox add-on, But it is not necessary, 360 Total Security Essential still protects you against hackers while shopping online, downloading files, and browsing web pages. Downloading and installation process of 360 Total Security Essential is very easy and free of toolbars and additional software suggestions. I would like to download 360 Total Security Essential offline installer to make the installation process quick and save time. After installation, You’ll find a very elegant interface where the options are structured in very nice and well organized manner. There is nothing you need to discover. As far as this question is concerned whether 360 Total Security Essential easy to use or not? Not overall, but 360 Total Security Essential is somewhat not an easy to use piece of software, I’ll explain it later, How? As you can see there is a button at the left hand side through which real time protection can be turned on or off. Underneath this button, you’ll find buttons to access antivirus and sandbox. You can change themes using the t-shirt icon at upper right corner and here you can also find settings button to make preferred settings. The quick scan mode is specifically designed to look into the operating system. Its job is verifying popular malware-hiding spots on the PC, such as system settings, common apps, running processes, startup items, and Windows critical files. We can say that The quick scan mode is also a PC optimizer. The full scan mode scans the entire hard drive for potential threats. The full scan mode may take some time depending on hard drive health and size. You can scan any preferred file, hard drive partition, folder’ memory card, USB flash drive, network places, CD DVD disk using the custom mode. Beneath this section on the left hand side, Here you can turn on or off Bitdefender and Avira engine at any time. You can compile a list of trusted items or programs and urls using the trust list. Actually the trust list is an instruction to 360 Total Security not to scan this list on future scan. You can add files, folders and URLs to a trust list. You’ll find it a very useful feature, It saves you time while visiting your favorite and trusted website and using a trusted software. Actually, it goes extreme when it comes to install or use a software. It takes into account every change to registry entries and the firewall and annoys you by popping up take to action notifications. As well as You can send files to quarantine to later examine them and decide whether you want to keep or eliminate the objects. You can submit suspicious items to file analysis. And now a bit about Sandbox, Sandbox is my one of the favorite features in 360 Total Security Essential. Although This is a very useful all type of PC users, But It’s specifically a superb feature for those who have to or love to test or use new software Like me. Sandbox module provides you a virtual secure and isolated atmosphere in which you can test software to find out whether it really has something suspicious and dangerous especially malware without harming your PC. For your convenience, 360 Total Security Essential integrates an entry for the sandbox into the Explorer shell to easily install and launch programs in a safe environment with minimum effort. You can schedule programs to automatically run in the sandbox when normally accessing them on your machine. And the best thing is that you can revoke network access to sandboxed programs. In addition to impressive list of useful features of 360 Total Security Essential. I’ve also experienced several problems and annoying notifications while testing 360 Total Security Essential. I decided to reboot my PC running Windows 7 after the installation and after reboot, It disturbed Internet download manager integration with all web browsers. It flagged many software, even trusted and reputable ones, as a malware, trojan, unwanted program, etc while downloading, installing and even while using programs. You can get rid of this problem using the trust list though, But as you know everyone does not want to dig into such complicated things, It’s not a new thing for veterans like me, But it’s a complicated thing for sure for those who do not know much about how these things work? In this regard, I found it a little bit hard to use piece of software. But to be honest, Its virus, malware, trojan and security threats detection ability is superb. I put it to analyze over 200 files with zero-day threats and it swiftly identified and eliminated all threats. I found 360 Total Security Essential a very lightweight piece of software on system resources. I experienced no crash, hang, display error messages, etc. while using it. As well as I felt a difference while using the internet in term of speed. 360 Total Security Essential puts 10 languages at your disposal and It’s available for Windows XP, Vista 7 8 and Windows 10 users. It’s free to use and ad-free. I was expecting a parental control feature in 360 Total Security Essential, But I did not find a parental control feature. But there is an option inside settings through which you can block desired websites. So This was what I found in 360 Total Security Essential and shared with you what is good and bad in this free to use yet ad-free security suite. I hope you like today’s 360 Total Security Essential review. Respected subscribers and tutorial on review.com readers, If I could explain anything properly or You’ve got a question, Feel free to ask using the comment section. I’ll my level best to solve your problems. Do not forget to share, like and subscribe.